Why Hire an E Type Jaguar Convertible? Experience the world’s most recognizable and desirable sportscar with a Jaguar E-Type hire. Drive this legendary classic Jaguar, and you will be noticed by everyone you pass. It’s what dreams are made of. Our E-type Roadster is in bright red with a red-piped leather interior and black hood. Take it for a spin round unspoilt Yorkshire lanes for that classic wind in the hair Jaguar driving experience. 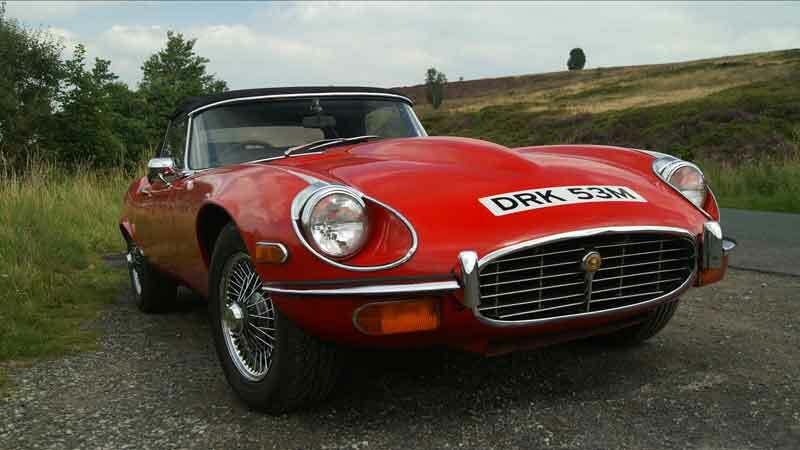 Self drive Jaguar E Type hire makes an unforgettable Birthday, Anniversary or Christmas gift. And if you want a stunning Jaguar E-Type wedding car, this is the one. A great wedding present from the bride to the groom. Our 1973 E-Type Jaguar series III Roadster is finished in bright red with a black leather interior with red piping, fantail exhaust and chrome wire wheels. It has a V12 5.3 litre engine, automatic gearbox and power steering. Enjoy the roar of the 12 cylinder engine as it powers the Jaguar gracefully to 60mph in 6.8 seconds. Compared to the Series 1 and series 11 E-Type Roadster our Series 111 is more practical. 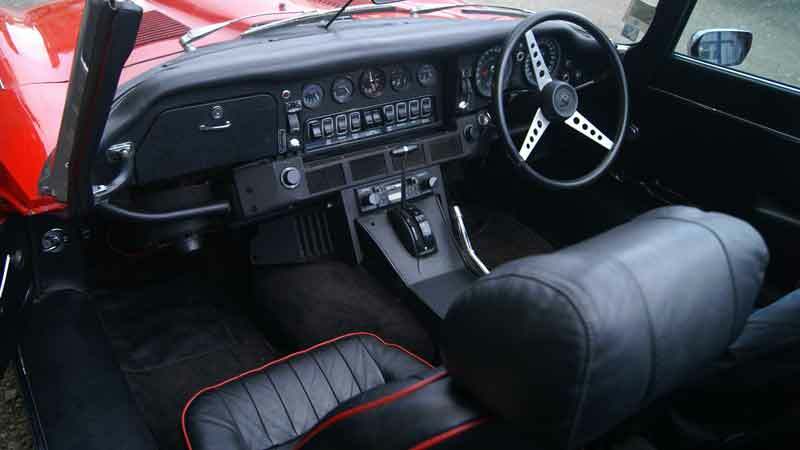 It has greater headroom than the earlier E Type models, making it more suitable for taller drivers. When the roof is down your head can protrude above the top of the windscreen in pre 1971 cars, which can be uncomfortable. This Jaguar E-Type convertible has been added to our classic car hire fleet for 2016 and joins our Jaguar E-Type Coupe. 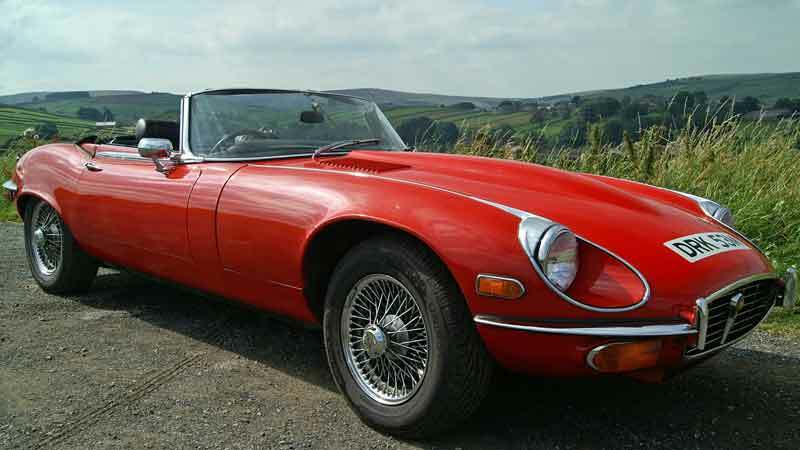 These iconic British sportscars will give you a Jaguar E-Type Hire to make you smile. 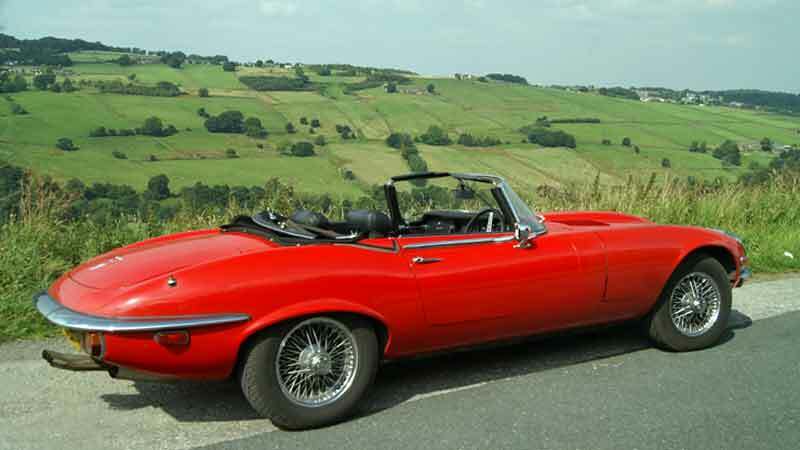 Our Jaguar E-Type hire car is available for collection in Keighley, West Yorkshire, not far from Skipton, the ‘Gateway to the Dales’. Our location is within easy reach of all the major towns and cities in the north of England. 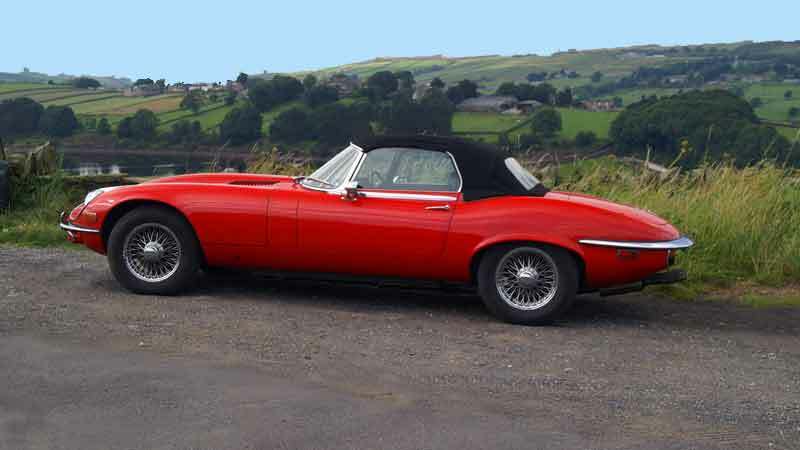 We are in an ideal location for Jaguar E-Type Hire Bradford, Wakefield, Harrogate and York. For Jaguar E-Type hire Preston, Blackburn, and Burnley, Lancashire you don’t have too far to travel either. We are within an hour’s drive of most of the towns in Lancashire via the M65 or A59. Sheffield Jaguar E-Type hire is just over 50 miles from our Keighley base. 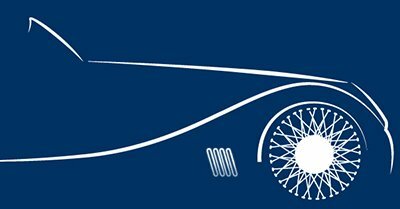 Once you’ve collected it, you can drive our Jaguar E-Type hire car anywhere in the UK subject to our terms and conditions.